At The Real Deal Tours we have every possible Arenal Nature and Eco tour in the Northern Arenal region that you can imagine. 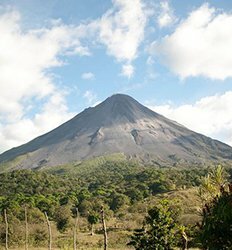 Many of Costa Rica’s tourists are drawn here because of the towering Arenal volcano whose summit reaches over 5,400 feet and is still very active! It doesn’t matter where you are in this region, you’ll have a perfect view of the majestic Arenal volcano. If you’re an avid hiker, you can hike near the summit and get the most spectacular panoramic view of the entire region. With such a diverse population of wildlife you can help but become a spectator to the various animals you will come across including monkeys, sloths and tropical birds. However, you didn’t come to Costa Rica just to watch the volcano Arenal right? Aside from the Arenal volcano, there are spectacular waterfalls in La Fortuna, crystalline blue rivers hidden in the rainforest, bat caves to explore, and so much more!! Lake Arenal and the many rivers are another major attraction for the Northern Arenal region. 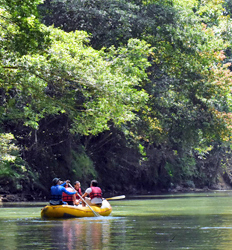 The Real Deal Tours also offers various Arenal Nature and Eco tours that include floating or paddling down beautiful rivers on your own kayak, canoe, or even a pontoon. A definite must when visiting Costa Rica! With so many Arenal Nature and Eco tours to choose from, you may have to make a second trip to Costa Rica! We’re all about birds! 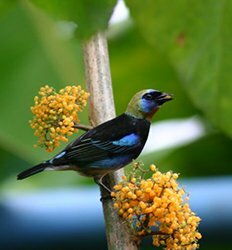 Come explore both morning and evening with this twice-daily bird watching tour near Arenal Volcano! Whether you are new to birding or more experienced with this fun hobby, there is something for every birdwatcher when you’re bird watching with us! 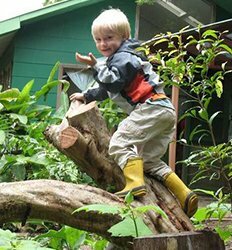 Birdwatching Near Arenal Volcano deposit is $15.00 per adult and $10.00 per child. La Fortuna waterfall is approximately 75 meters high and plunges into an emerald green watering hole. Located only 6 km from the town of La Fortuna at the base of the Arenal volcano, our naturalist guides will lead you through the dense tropical rain-forest pointing out monkeys, sloths, and a variety of other wildlife in their natural habitat. Have you ever hiked along antique lava flows and volcanic rock? If you love nature and appreciate the history and wildlife that help define Costa Rica´s pura vida, then the Arenal Volcano Tour is certainly for you! Take a step back in history to 1968 when the Arenal Volcano first exploded and destroyed the town of Tabacón. This tour is "National Park Only", for more options see details. Did you know that 90% of all the organisms in Costa Rica’s rainforests and cloud forests are found atop the gigantic trees? Back in the day, biologists would use ropes and pulleys to climb up to the canopy of these trees. Some trees so tall it was almost impossible to explore! Join us on this fascinating subterranean adventure where we'll hike through the endless maze of caverns of an underground river. The Venado Caves are estimated to be nearly 20 million years old, formed by underground streams that still flow through the limestone caves today. Don't miss out this unique once in a lifetime opportunity. Are you ready for the most authentic & extreme Costa Rica hike? 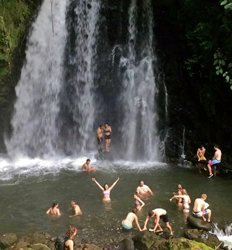 How would you like to swim in the crater lake of Cerro Chato, cross hanging bridges, visit a waterfall, explore the Arenal Volcano Observatory, enjoy a therapeutic facial and finish the day with a cocktail while you reward yourself in the Arenal hot springs? 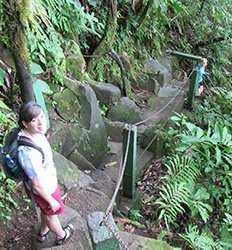 Hike Chato & Arenal: Two Volcano Extreme Hike deposit is $19.00 per person. 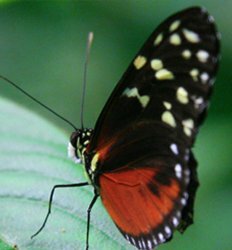 Whether you want an activity the whole family can do together, or just want to experience these beautiful creatures up close for yourself, a tour of the butterfly garden at Danaus Eco-Center is a great choice! Our expert naturalist guides will ensure you get the most out of your eco tour experience. Ever wonder how the forest changes when dusk sets in? 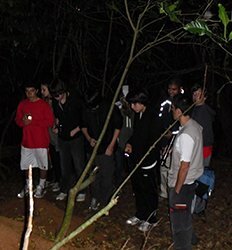 Check out our Night Jungle Walk tour and experience it for yourself! When the sun goes down, the forest comes alive! Our well experienced expert guides will point out all the things our un-trained eyes might miss in the darkness as we wind our way through the Ecocentro Danaus. El Cerro Chato Volcano Hike is considered a physically challenging and intense hike. But like anything else, the reward for reaching the summit is well worth the climb! 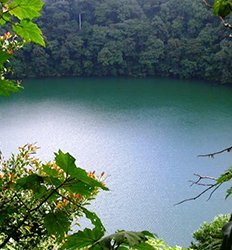 The El Cerro Chato Volcano Hike will take you through the lush rainforest that is home to many species of birds including the green macaw as well other wildlife species. A contender to be one of the Seven Natural Wonders of the World and definitely one of Costa Rica's top 7 Natural Wonders, The Rio Celeste is one of the most majestic places for hiking in Costa Rica. 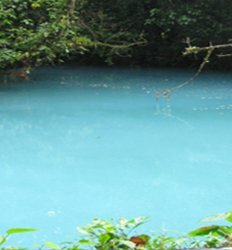 Surrounded by stunning rainforest and magnificent waterfalls, the aqua marine color of Rio Celeste is simply breath taking. 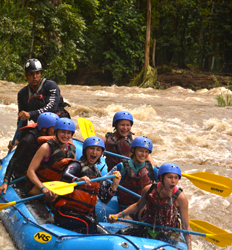 An all in one adventure; The Real Deal Tours´ Arenal Super Combo including the Hanging Bridges, Waterfall and Arenal Volcano hike will by far become one of your best experiences in Costa Rica! 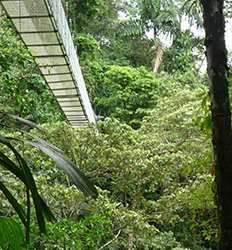 You´ll hike approximately 1.5 miles to reach the hanging bridges of Arenal which are strategically and securely placed among the towering trees. As one of the lesser-explored national parks in Costa Rica, a visit here will put you directly in touch with the elements that make this beautiful region so unique and desirable. The Juan Castro Blanco National Park tour is an absolute treat for nature lovers looking to experience first-hand the legendary beauty Costa Rica is so famous for. 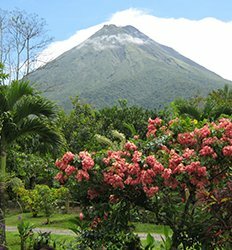 Looking to explore the Arenal Volcano but not interested in a full day hike or hot springs resort? 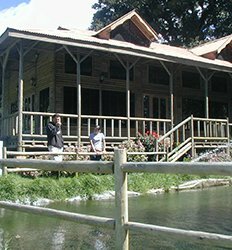 With over 800 acres to explore and a spectacular view of the volcano, a trip to the Arenal Observatory Lodge is perfect for the whole family! Add in a couple of suspension bridges, volcanic mud and soothing hot springs river and the Arenal Observatory Volcano tour is one heck of a deal! 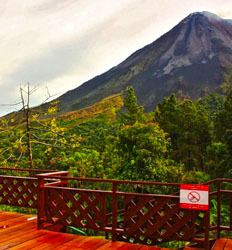 Arenal Observatory Volcano Tour Tour deposit is $15.00 per person. If a lazy river float and some decadent chocolate sounds about right to you, this is your perfect day! We’ll start out gliding along the shore of the Penas Blancas River, listening to the many calls of the wild, before we take this party indoors for Cacao 101. Sampling is very much encouraged. 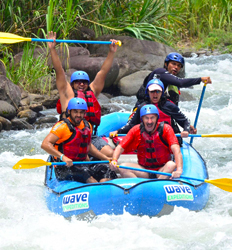 Peñas Blancas Safari Float + Chocolate Tour Costa Rica Tour deposit is $18.00 per person.